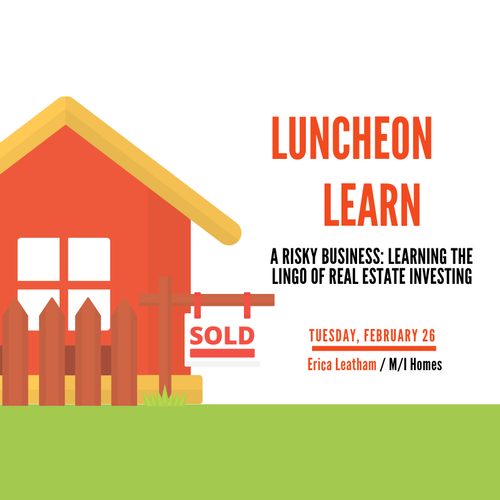 "A Risky Business: Learning the Lingo of Real Estate Investing"
M/I Homes VP of Planning & Entitlements Erica Leatham will be guiding a interactive and informative session on real estate risk and investment basics. This hands-on presentation will walk attendees through common terminology, definitions and a high-level understanding of what it takes to make development happen. Great opportunity for those new to the industry to learn the ropes and begin developing confidence in their knowledge of investing. Lunch will be provided. Attendance is limited to 45 - don't wait to register, as spots will go quickly.